In this gripping, gorgeous literary drama, two suburban families are hopelessly entangled during an explosive Thanksgiving weekend that changes their lives forever. When Benjamin’s wife kicks him out of their house, he returns to his childhood home in Connecticut to live with his widowed father. Lost, lonely, and doubting everything he felt he knew about marriage and love—even as his eighty-year-old father begins to date again—Benjamin is trying to put his life back together when he recognizes someone down the street: his high school crush, the untouchable Audrey Martin. Audrey has just moved to the neighborhood with her high-powered lawyer husband and their rebellious teenager, Emily. As it turns out, Audrey isn’t so untouchable anymore, and she and Benjamin begin to discover, in each other’s company, answers to many of their own deepest longings. Meanwhile, as the neighborhood is wracked by a mysterious series of robberies, Audrey seems to be hiding a tragic secret, and her husband, Andrew, becomes involved in a dangerous professional game he can never win. And, by the way, who is paying attention to Emily? 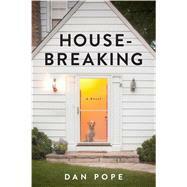 Powerful, provocative, and psychologically gripping, Housebreaking explores the ways that two families—and four lives—can all too easily veer off track, losing sight of everyone, and everything, they once held dear. Like the best from Tom Perrotta and Rick Moody, who capture the darker truths of modern suburban life, this literary triumph from an immensely talented writer offers an insightful and funny, yet terrifyingly authentic portrait of modern suburban life that reveals, hauntingly, how little we know of one another’s lives.